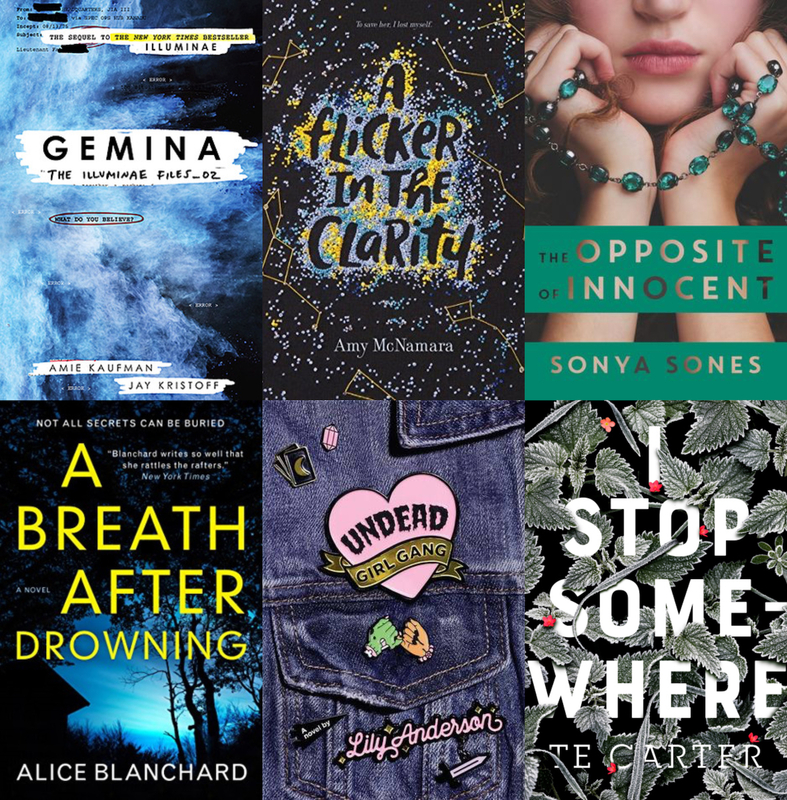 As I mentioned in part 1 of my May reads, I did a lot of reading last month, so I decided to divide the reviews into two posts and now I’m back with 6 more reviews including some books I really highly recommend you pick up! I absolutely adored Illuminae, I mean, I read the book twice in the last year, so I had pretty high expectations going into the sequel, Gemina by Amie Kaufman and Jay Kristoff, and were they met? Mostly. There are two new main characters in this novel, Hanna and Nik, and I don’t love them quite as much as Kady and Ezra. The focus of the story is a space station that comes under attack, but there’s an alien element that wasn’t as creepy as I hoped, especially in comparison to the virus storyline from Illuminae. 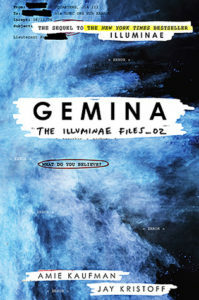 The other minor complaint I had was that I felt like Gemina was a lot heavier on the security footage excerpts, which are just less fun to read than the rest of the dossier-like format of these novels. That said, those are all very minor complaints from a series that has quickly become one of my favourites. Gemina is still packed with intensity, and the format is beautiful and unique. I really love the way the last chunk of the book was done. I actually listened to the story while reading along, and like with book 1, the audiobook was excellent. There are also plenty of fun twists in the book. When I finished I was grateful I had waited to read this book until book 3, Obsidio, came out because I really needed to see how things turned out. I cannot recommend this series enough! 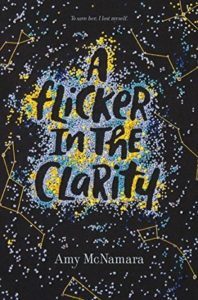 A Flicker in the Clarity by Amy McNamara is a beautifully written, quiet contemporary young adult novel about Evie, who has been best friends with Emma for years. Emma was always the outgoing one, but after Evie makes a mistake and Emma shuts her out, Evie has to figure who she is on her own. There are a lot of books about friends or sisters where one outshines the other, but what makes Evie’s story so special is McNamara’s writing and the character depth and complexity of the story. Evie’s character just feels so real. She is quiet and shy and doesn’t see the good parts of herself and I just wanted to reach through the pages and tell her to take better care of herself. Her love interest, Theo, is quirky and smart, and I loved his passion and was really rooting for them. Everything about A Flicker in the Clarity felt genuine, even the ending…even if I might have wanted something different, it was refreshing to read a book with this kind of believable ending. I actually realized after reading A Flicker in the Clarity that it appears to be a companion novel to McNamara’s first book Lovely, Dark, and Deep so I wish I had picked up that one first, but given there was a 6 year wait between books, I’m glad I have one more novel by McNamara left to read while I wait anxiously for her next book. 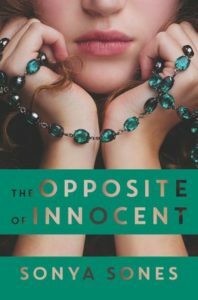 I’m always interested in reading a new novel in verse, so of course I had to pick up The Opposite of Innocent by Sonya Sones, one of the most established names writing in that format. This is a quick read about a teenage girl, Lily, who has a crush on a much older man that is a friend of her parents, Luke. When Luke moves in with her family it is Lily’s dream come true. But after Luke kisses Lily, what seemed like a dream quickly becomes a nightmare. The voice of Lily in The Opposite of Innocent feels genuine and I wanted nothing more for her parents or somebody to figure out what was going on and help put an end to it. Sones captures that helplessness and struggle realistically, and the ultimate outcome is a very heartbreaking story. Even though the writing is so sparse, I felt like I really got to know Lily and her friends. That said, I wish that the book was longer and that the ending was less open-ended, it felt like a bit of a cope out after all that happened to leave things that way. Still, I enjoyed Sones writing and I’ll definitely continue to pick up books by her in the future. I hadn’t heard anything about A Breath After Drowning by Alice Blanchard prior to receiving a copy in the mail (and check out the cool mailer it came in! ), but I love dark suspense thrillers, so I immediately knew I was going to read it. I even managed to get an audiobook copy from the library, which was great. 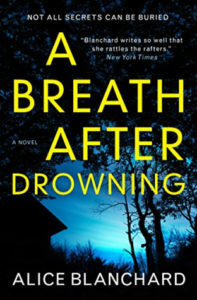 A Breath After Drowning is the story of child psychiatrist Kate, whose sister was murdered, and who finds herself re-examining the evidence sixteen years later and wondering if the right man is on death row. Since Kate is a psychiatrist, a lot of the book revolves around her latest patient with a connection to her sister, and the fallout from a previous patient that committed suicide. The story had an interesting premise and seemed well-researched, but it just moves so so slowly that wasn’t until over halfway into the book that I really felt like there was any intensity building. Kate also, despite seeming like a smart person, makes a lot of frustrating and not-smart choices. I did enjoy the slow-burning the intensity of the last couple hundred pages, but there were no actual surprises despite having many twists. Listening to the audiobook it became very very obvious how terrible the dialogue was. This is definitely a case of a book I enjoyed more when I was reading my paper copy, but even that couldn’t save the horrible, ridiculous fight scene that occurs near the end of the book. Overall, I feel like Blanchard is an author with a lot of potential, but unless a book came highly recommended by someone whose opinion I respect I’m unlikely to read anything else by her in the future. I definitely would not have picked up Undead Girl Gang by Lily Anderson if it hadn’t been raved about by Books and Lala on YouTube. Also, the audiobook is narrated by Rebecca Soler, and I’ll listen to basically any book she narrates, she’s amazing. Still, I was pretty skeptical going into this book about Riley, a teenage girl whose best friend recently committed suicide, following two other girls in her class. Riley tries to bring her friend back to life, but the other two girls–popular ones that were never nice to the two of them–come back as well. Undead Girl Gang is the perfect mix of humour, mystery, genuine emotion, and it just happens to have a paranormal twist to it. The only tiny complaint I have about the book is that I did wish there had been a little more build-up to the ending but overall, the story was well-paced and exceptionally well-written. Anderson perfectly captures the high school dynamic, including friendship and crushes. There’s just so much to love about this book, including the main character, Riley, who is imperfect but completely relatable. I just loved her snark. 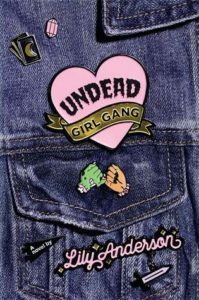 Of course, Anderson’s writing is so fantastic, I’ll definitely have to read more by her going forward, and if you’re even the littlest bit intrigued, I highly recommend you pick up Undead Girl Gang yourself! 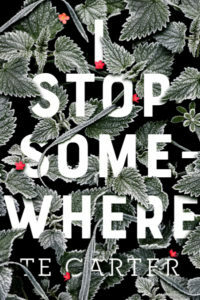 I generally don’t like to know too much about books before I read them, but in the case of I Stop Somewhere by T. E. Carter, well, I really had an incorrect idea of what this one is about. I went in thinking it was a dark mystery, but while it is dark, it is really a character-driven story about Ellie, a girl who experiences a brutal assault. The plot is quite minor, and this is such a quiet and disturbing story that the audiobook I listened to was likely not the right format. I Stop Somewhere moves between the past and present, and even knowing how things turn out for Ellie, I kept wanting things to turn out differently. The book is thoughtfully written and tells an important story, but I just felt like the writing really dragged and it could have been half as long and still gotten the same story across. I had a hard time connecting with Ellie, and I wanted more from the secondary characters, especially Ellie’s dad. I wish I would have gone into reading I Stop Somewhere with different expectations, but if you are considering reading it just know it is a depressing, haunting and thought-provoking book. I Stop Somewhere may not be a book I’d reread, but I am glad stories like this are being told. Phew, that’s it for May. But what about June and the 6 books I’ve already read without reviewing yet? We just won’t talk about those. Instead, tell me, what is the best book you’ve ready lately? Will you be picking up any of these?